Marshawn Lynch, with 67 yards rushing and 76 receiving, delivered a rare feat in Seahawks’ history Sunday as Seattle shakily improved to 5-3. 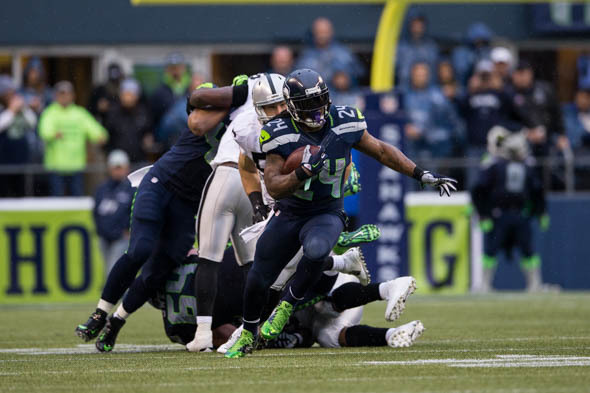 Marshawn Lynch has produced numerous big moments for the Seahawks, but rarely has he had a game quite like Sunday’s, when he ran for 67 yards and two touchdowns and caught five passes for 76 in Seattle’s 30-24 victory over the Oakland Raiders. Lynch’s numbers would have been more impressive if not for three plays. Lynch had a 43-yard catch from Russell Wilson nixed due to a holding penalty on rookie Paul Richardson, a 20-yard run scotched on a motion flag on Garry Gilliam, and an 11-yard catch wiped out when Gilliam was flagged a second time (ineligible receiver downfield). Even with the call backs, Pete Carroll seemed elated that the Seahawks were able to “feed the Beast” as many times as they did only a week after Lynch had a meager 15 touches (14 rush, one pass) against the Carolina Panthers. The most memorable play covered only three yards and will live long in Lynch lore (see Thiel: Seahawks Return to the Mode of the Beast). Sunday’s game marked the sixth time in Lynch’s career, and his third as a Seahawk, that he led his team in rushing and receiving yards in the same game. His 67 rushing yards came on 21 attempts and his 76 receiving yards on five targets by Russell Wilson. Lynch caught all five. Five performances did not make the list because they didn’t quite meet the criteria. Going chronologically, former fullback John L. Williams had 109 (rushing) and 74 (receiving) in the Kingdome Dec. 11, 1988 against John Elway’s Denver Broncos. But his 74 receiving yards didn’t lead the Seahawks that day as Steve Largent had 76. Williams produced a 64/71 game at New England Sept. 24, 1989. His 71 receiving yards led the team, but Curt Warner ran for 65 that day. WR Joey Galloway had an 86/114 game against Jacksonville Nov. 12, 1995 that included an 86-yard reverse for a touchdown and two TD catches. But Chris Warren ran for 121 yards to lead the team. Shaun Alexander ran for 74 and caught eight passes for 77 in a 31-24 loss at San Francisco Dec. 1, 2002, but Darrell Jackson had 114 receiving yards and a pair of touchdowns. The first game in which Lynch led the Seahawks in both rushing and receiving occurred Sept. 13, 2011 against Baltimore when he ran for 109 and caught five passes for 58, 12 shy of the criteria. The most remarkable game on the list was Alexander’s Sept. 29, 2002, against the Vikings. In that one, the Seahawks scored 28 points in a 1:47 span in the second quarter. Alexander scored three of those TDs, one on an 80-yard pass from Trent Dilfer. Russell Wilson did not have good game against the Raiders – in fact, he delivered one of the worst of his career. He completed 17 of 35, didn’t throw a touchdown, nearly threw two interceptions, and finished with a passer rating of 63.9. Wilson attempted 11 passes that traveled more than 10 yards downfield. He completed two, 18.2 percent, tied for the worst percentage on such throws in his career. Wilson also had 12 off-target passes Sunday, a career high. While he went 5-for-5 with Marshawn Lynch and 5-for-6 with Doug Baldwin, he went 1-for-7 with Jermaine Kearse and 1-for-5 with Luke Willson. It’s simply a miracle Wilson isn’t in the hospital, given the lack of an O-line. We only had ONE veteran lineman in the game after Carpenter went down and that includes tight end. So of 6 positions, Sweezy was there with backups and rookies and that is simply a formula for disaster. Until Miller, Unger, Okung and now Carpenter are healthy, don’t look for much from the offense. Steve wrote….”a 20-yard run(by Lynch) scotched on a motion flag on Garry Gilliam”. First of all in this crazy Seahawk season this stands out that we had guys like Gilliam out there influencing the game with evident patchwork going on to squeeze the Jeeves out of fate for a win. to scotch a rumor; to scotch a plan.2. to cut, gash, or score.3. to injure so as to make harmless. 4. Now he def didnt score so we can throw that one out… but penalties have made a number of his runs harmless in this game and others.Its sad enough to say it again. Marshawn probably wanted to imbibe the noun(Scotch)after that game in suppressing the “What do i have to do to get an EASY game scoring ” for this season. It just seems like he has been pilfered from entirely too much with these yardage snatching penalties this season .If he was Percy Harvin he might be slapping someone silly for all of the dreadful unjust feelings he had brewing from within. A toast to the Beast because those relentless legs never stop churning to try to get his team a score every time he is afforded the opportunity. And for Marshawn’s sake?Please? A merciful return to Health Seattle so we can end this patchwork fiasco.